Technology has come a long way since the 1980s, and the Teenage Mutant Ninja Turtles have evolved to match those drastic changes. However, despite the improvements in their visual effects, they’ve never stopped convincingly depicting the trust and love they have for one another. Teenage Mutant Ninja Turtles: Out of the Shadows hits theaters this weekend, it will seemingly continue the long cinematic tradition of outlandish turtle-based action and brotherly bonding. The fit score is where we decide if a film even belongs within the 3D category, and this one is really a no-brainer. Teenage Mutant Ninja Turtles: Out of the Shadows is a non-stop adventure full of vibrant action sequences and colorful characters. It’s the type of movie you take the kids to, and it’s the type of movie where the kids go crazy for the 3D effects throughout the entire run time of the film. Like so many other superhero movies currently out in theaters, Out of the Shadows feels right at home in within this style of filmmaking, and tailor made for the 3D format – regardless of the quality of execution. Although you probably gleaned this from the title, the Planning & Effort category is where we analyze the amount of thought and preparation that the filmmakers put into a movie’s 3D. Much like the previous Teenage Mutant Ninja Turtles movie, Out of the Shadows relies on post-production 3D conversion, rather than actually shooting on 3D – a route chosen by most recent superhero films. However, director David Green does make up for this by clearly showing that the film is built as a 3D adventure. The camera work is insanely kinetic, and seemingly every shot featuring CGI looks specifically designed to use 3D to make something pop for the audience. Quite a bit of planning, but not quite as much effort. Depending on your perception of 3D and its purpose in modern filmmaking, the Before the Window category is where Out of the Shadows will grab you or lose you. This category essentially analyzes the extent to which things "pop" or fly at you through the use of 3D. Seemingly every VFX shot in Teenage Mutant Ninja Turtles: Out of the Shadows features something flying at you – from tank shells, to hockey pucks, to the turtles themselves. The camera also never stops moving, so many sequences turn the theater seats into a bona fide roller coaster ride as sewer pipes and skyscrapers never stop flying towards us. If you’re not careful, it will even startle you at certain points in the film. For all points Teenage Mutant Ninja Turtles: Out of the Shadows earns in the Before the Window category, it doesn’t come nearly as close Beyond the Window. With a few notable exceptions – particularly a sequence involving a cargo plane – Out of the Shadows never really uses 3D to emphasize depth of field, or create sweeping panoramas. The film is simply far more concerned with what’s coming at the camera than everything else captured by the lens. As a result of this, the overall scale of the movie can sometimes feel a bit diminished. Brightness is a category where Teenage Mutant Ninja Turtles: Out of the Shadows really feels hit or miss. Some of the sequences in the early portion of the film – particularly the first encounter between Casey Jones (Stephen Amell) and April O’Neil (Megan Fox) – definitely could have received some better lighting from the production crew. However, as the film wears, on the sequences become better lit, and much easier to follow along with. It never becomes an issue that threatens to derail the film, but with a title like Out of the Shadows, one would imagine that they could have done a whole lot better to illuminate the action. If you’re the type of person who needs to regularly remove 3D glasses in order to rest the bridge of your nose, then you’re in luck. Teenage Mutant Ninja Turtles: Out of the Shadows never features an overwhelming amount of blur in its 3D conversion, and certain quieter scenes feature an almost negligible amount of the effect. Just about any scene revolving solely around Casey Jones and April O’Neil represents a prime opportunity to remove the glasses if you see fit, but just make sure to throw them back on whenever an anthropomorphic CGI character appears on screen. Despite the fact that Teenage Mutant Ninja Turtles: Out of the Shadows is a relatively enjoyable 3D adventure, it can also feel a bit physically taxing at times. If I learned one thing throughout the course of watching this movie, it’s that shaky camerawork and 3D are a match made in the lowest circle of hell. The film paces out its action sequences well enough that we get reprieves from this phenomenon, but the movie’s climactic action sequence features an array of shaky cam and POV shots that will undoubtedly do a number on your eyes if you aren’t careful. If you’re prone to eyestrain, then you might want to opt for 2D. Final Verdict: Ultimately Teenage Mutant Ninja Turtles: Out of the Shadows is a superhero adventure that opts to use its 3D format to appeal to the kids in the audience rather than the die hard cinephiles – and that’s not necessarily a bad thing. It’s a movie full of gimmicks and frantic effects, but in the process it manages to lose a bit of its scope and coherency. In a world where most big budget action blockbusters are doing 3D better than this, you might want to save your money and see Out of the Shadows in standard 2D if you aren't taking kids to see it. 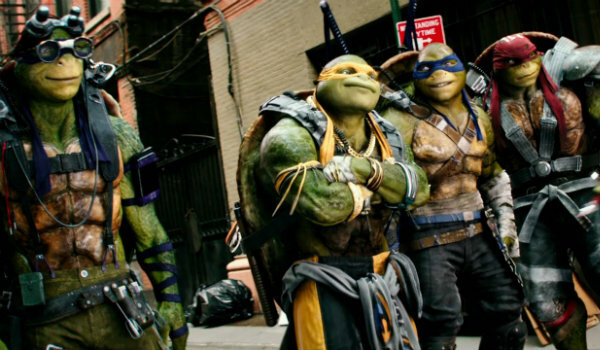 How Will You See Teenage Mutant Ninja Turtles 2?